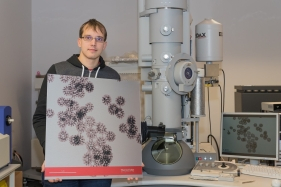 Martynas Skapas junior researcher from the Department of Characterisation of Materials Structure won award in Thermo Fisher Scientific's Electron Microsope Image Contest in the category of TEM of 2018 October. The photograph presents the sample, which shows CoFe particles embedded in Graphene-like spheres. Image taken in Bright-Field mode with objective apperture inserted. Martynas helds the image CoFe nanoparticles printed by Thermo Fisher on a plate of aluminium alloy and on the PC monitor one can see the original image.